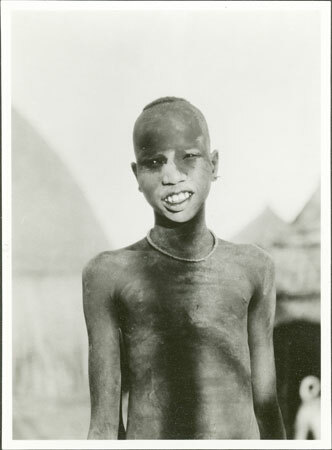 An upper body portrait of a male youth (identified as Thoar) with shaved head and ash smeared on his face, probably at the Lou Nuer camp at Yacwac. Evans-Pritchard spent 3 months at this camp in 1931. An unmarried Thoar son of Kirkir is mentioned in Evans-Pritchard's kinship diagram of Yakwach camp. Note on print reverse ms pencil - "09 71 "
The kinship diagram of Yakwach camp is on pages xxvi & xxvii of E. E. Evans-Pritchard's Kinship and Marriage Among the Nuer (Clarendon Press, Oxford 1990 ). Morton, Chris. "Nuer youth at cattle camp" Southern Sudan Project (in development). 03 Jan. 2006. Pitt Rivers Museum. <http://southernsudan.prm.ox.ac.uk/details/1998.346.71.2/>.